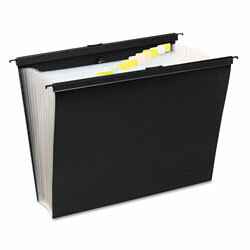 Expanding file with bungee closure keeps documents organized on the go. Create an entire filing system to meet your specific needs by mixing and matching items from the full selection of slide-bar filing products. Hanging File Folder Type: Specialty with Retractable Hooks; Size: Letter; Expansion: 15"; Material(s): Polypropylene. 8 1/2 x 11 Black Hanging File Folders from Wilson Jones! 2125 In Stock today.